RUGER'S FULL POWER FLOOR CRANES... BUILT LIKE A TANK! RUGER’S FULL POWER FLOOR CRANES… BUILT LIKE A TANK! STREETSBORO, OH — Ruger Industries’ Full Powered Floor Cranes offer greater productivity and ergonomic advantages over manual models. Built to last, these versatile and powerful cranes are manufactured to handle continuous industrial use in repetitive lifting applications. Ruger Industries, a division of The David Round Company, manufactures the highest quality Full Power Floor Cranes. Ergonomically built, Ruger’s Full Power Floor Cranes reduce or eliminate the need for motorized lift trucks! Help knock out many backbreaking activities while easily navigating standard door openings, narrow aisles and elevators. Our Full Power Floor Cranes are safer, smaller and a less expensive alternative. 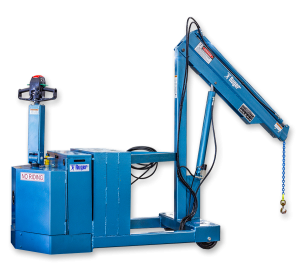 Ruger’s A-Series cranes have adjustable legs to straddle various-sized loads; the boom is power adjustable and holds capacities up to 4000 lbs. The R-Series provides a reverse base to eliminate any obstruction from leg straddle designs for easy access to wide loads and holds capacities up to 6000 lbs. Customizable in almost every industry from pharmaceutical and food manufacturing to oil and gas, aviation, pulp and paper and water control. Ruger’s Full Power Floor Cranes improve handling system efficiency while making the workplace a more productive and safer environment through their ergonomic designs. Ruger’s Full Power Floor Cranes are tested and exceed ANSI/ASME PALD standards. Meets ANZI Z535.